I used to joke about this, but I’ve decided it’s actually true: the lack of pockets is holding women back. I mean, if our choices are either carry a purse everywhere and don’t let it out of sight, ask someone of the opposite gender to hold things for us, or attempt to stick our phones in our bras, of course we’re going to struggle to be taken seriously. I do carry some kind of bag most places I go (with essential stuff like my notebook, and sometimes knitting in it), but there are lots of times when just pockets will do. Everyone needs pockets, good pockets that are actually big enough to put your phone in, and sit down afterwards. I was so exited about finishing this dress that I forgot to add the pockets, and had to go back and put them in! I’ll include a bit about the decorative edging I used at the end of the post. This is why maker & fixer skills are important: instead of complaining about the lack of pockets, we can change it, and add some ourselves. Guys who don’t have enough pockets in their lives are welcome too! 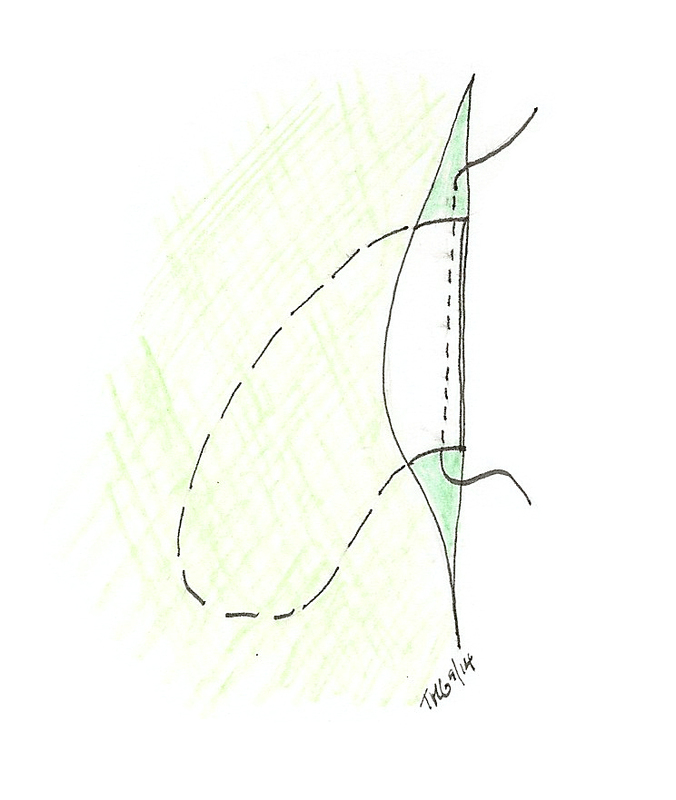 In this post I’ll go over adding pockets to a seam in your garment, commonly called “side-seam” or “in-seam” pockets. 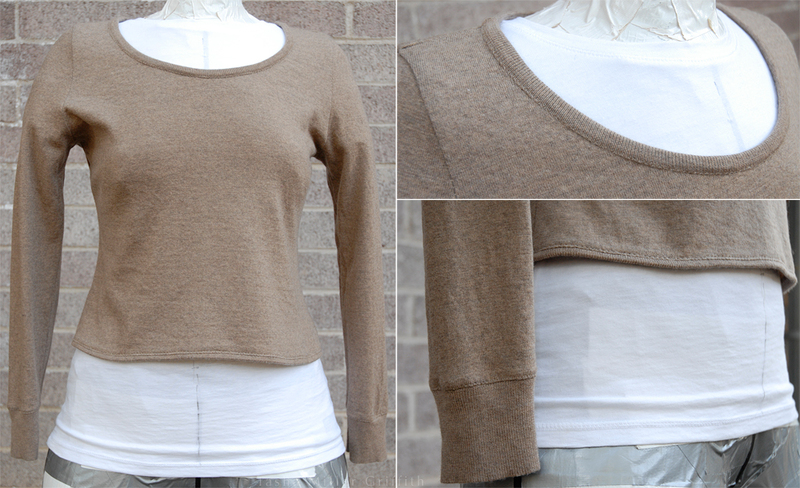 You can do this as you’re sewing, or retrofit pockets into a garment that’s already finished. In short, the steps are: 1. Plan your pocket, and prepare the pieces. 2. 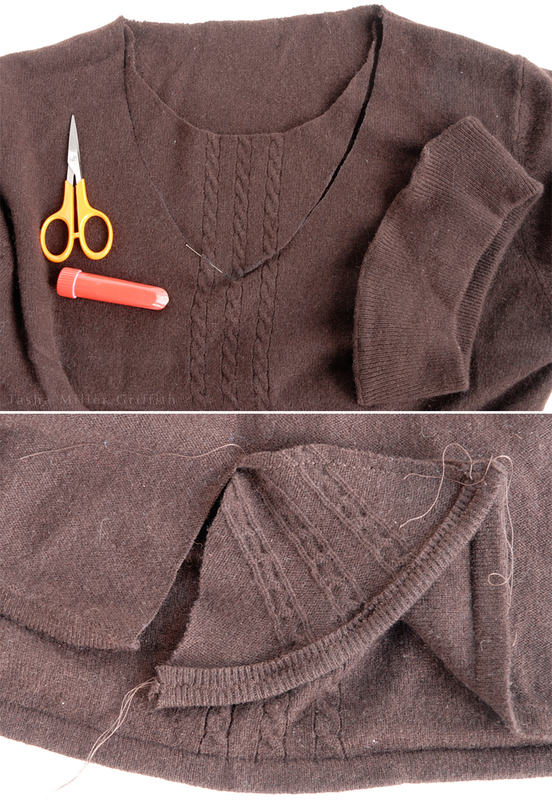 Sew the pocket pieces to the garment seams. 3. Sew the garment seams, including around the pocket. If you have some beginner sewing skills, you can handle this. (Ahem, get some skills here.) Let’s get started! As usual, click on any of the photos to enlarge for a closer look. First figure out how big and what shape you’d like your pocket to be. You can use a pocket piece from a pattern you have, or trace the shape of an existing pocket that you like onto paper for a pattern. 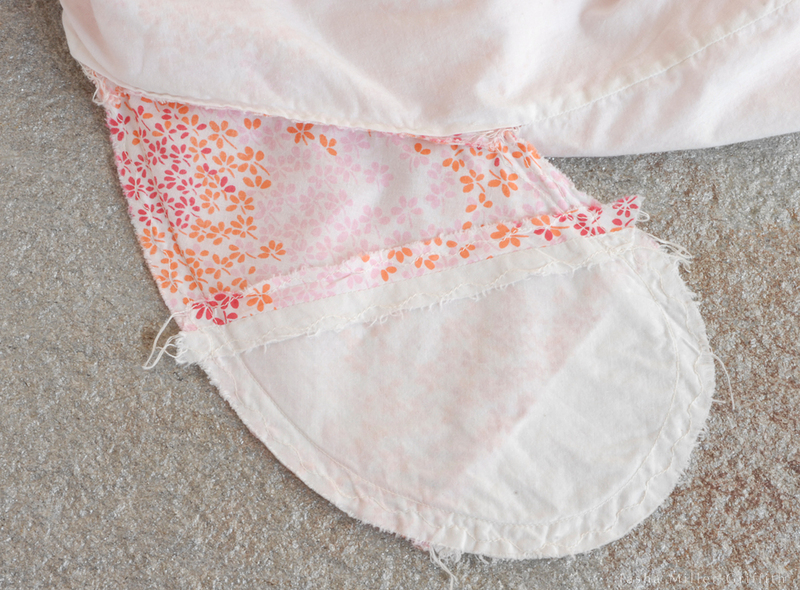 (If you trace an existing pocket, remember to add extra space—seam allowance—all around it to account for the fabric that will be used up in the seams.) 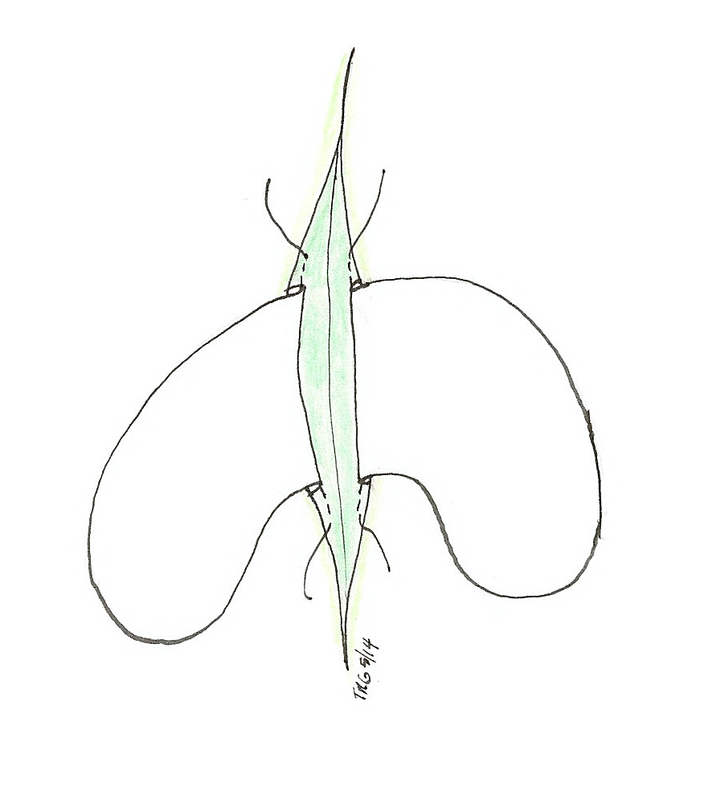 I used the pattern piece at right, which is a common shape for side-seam pockets. Figure out where along your seam you want your pocket to go, and mark it with pins. 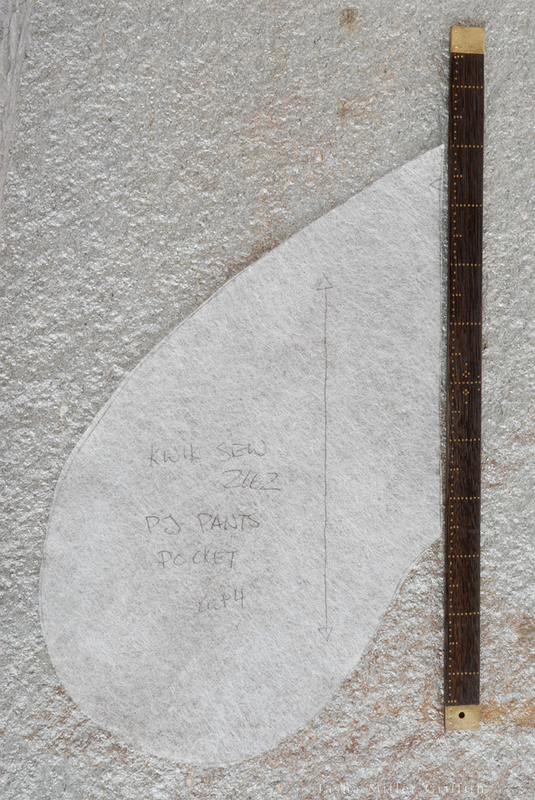 Measure the length of the flat side of your pocket, the part that you’ll sew into the seam. 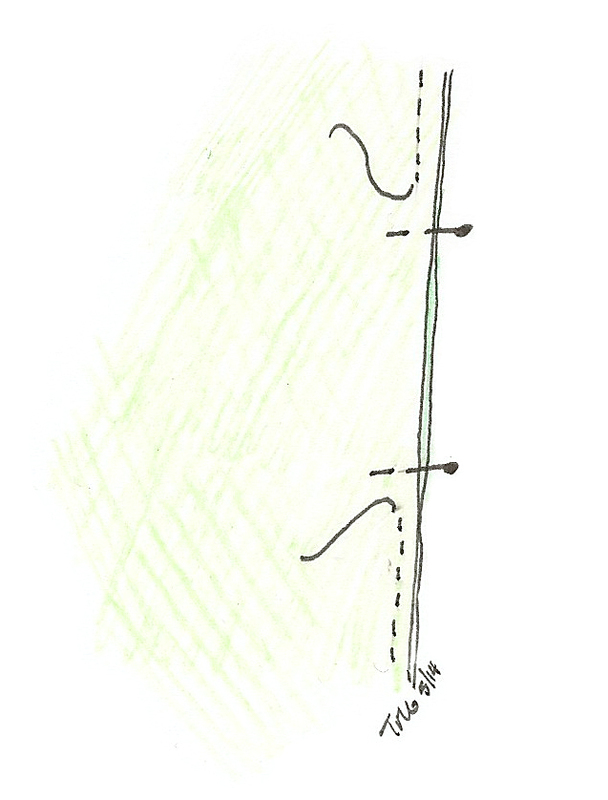 This is how much space you’ll need on your seam for the pocket. If you’re sewing from scratch, you can just center the pocket on your pin marks, and sew it as explained below, before you sew the seam. If you’re adding pockets to a garment that’s already finished, you’ll need to rip the seam where you want the pocket to go, taking out a space a bit bigger than the pocket piece, to give yourself room to work. I really like using this method to rip seams. Don’t worry about tying off the ends of the old seam here, because you’ll sew over them later. You’ll need two pocket pieces for each pocket you want to add. Cut them so that they’re mirror images, i.e. so that you can sew the shape together and have the right (public/outside) sides of the fabric touching. This kind of pocket doesn’t show much, but you’ll probably be able to see a bit of it peeking out. If you have matching fabric, obviously cutting your pockets from that will make it blend in the most. 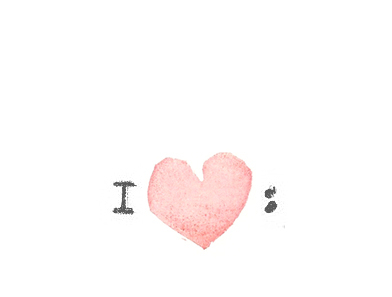 If not, choose something you like that you won’t mind seeing a bit of. The pocket fabric should be fairly tightly woven/sturdy, especially if you plan to carry heavy objects in it. If you have only a bit of matching fabric, you can cut each side of the pocket in two pieces, so that the matching part is at the top. When planning this, don’t forget to add extra seam allowance where the pieces meet. Sew the pieces together into the pocket shape before you attach them. On close inspection you can see that the two halves of this pocket are pieced in different places, and that’s fine. 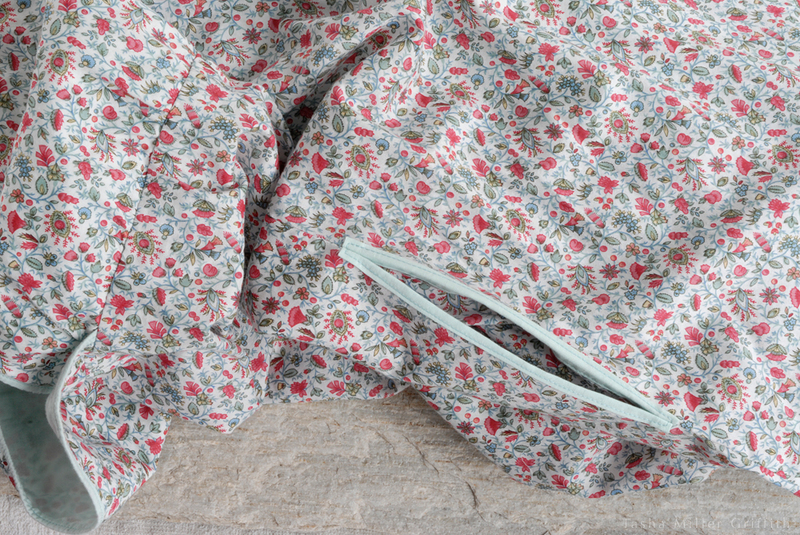 The printed fabric matches the outside of this dress, and the white is scraps from the lining. Note: You can also add to a skimpy existing pocket (I hate those! ), by cutting off the bottom and adding more. Rip a bit of the old pocket seams along the sides to give yourself room to work. 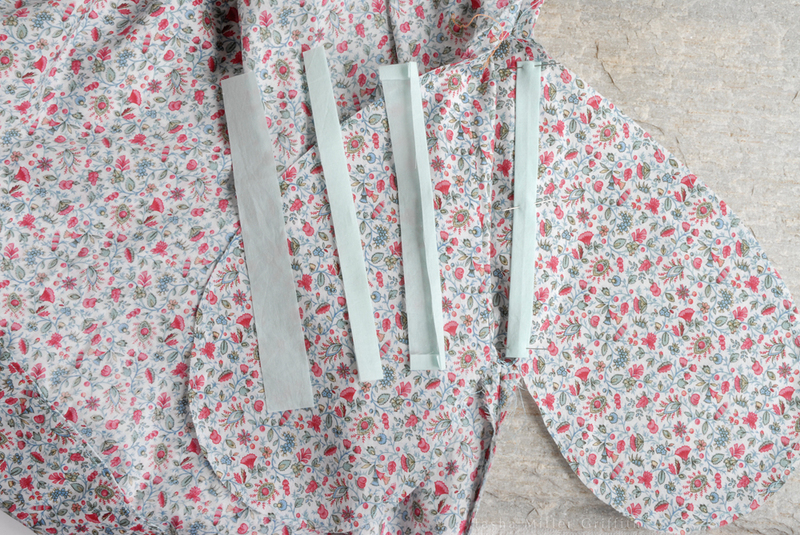 Sew each side of the new pocket bottoms to the old pocket tops, then sew around the pocket, overlapping the old seam. The finished pocket may look something like the one above. Once you have your pocket ready and know where it will go, pin one pocket piece onto one side of the garment seam. Line up the seam allowances, and make sure you place the right side of the pocket touching the right side of the garment piece. 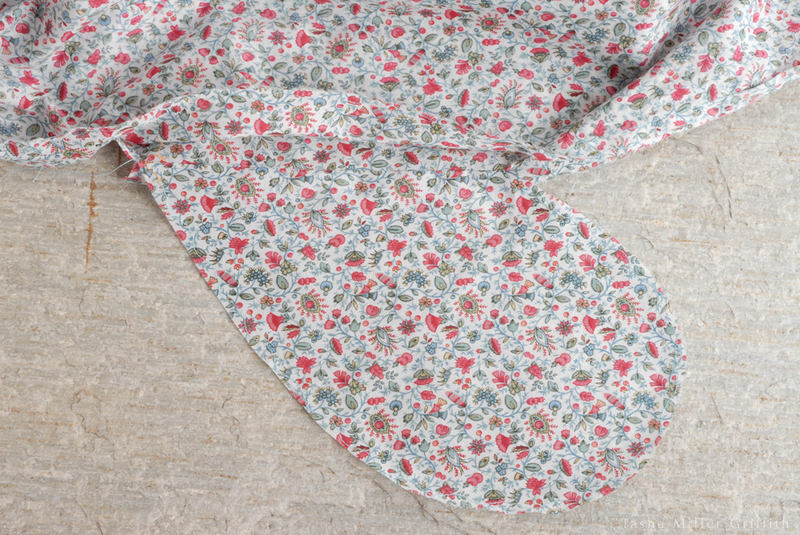 Sew the pocket on, using the same seam allowance as the garment seam, or just slightly narrower. Start and stop a little bit outside the pocket. You don’t need to back-tack your seams, they’ll be held in place by other stitches later. 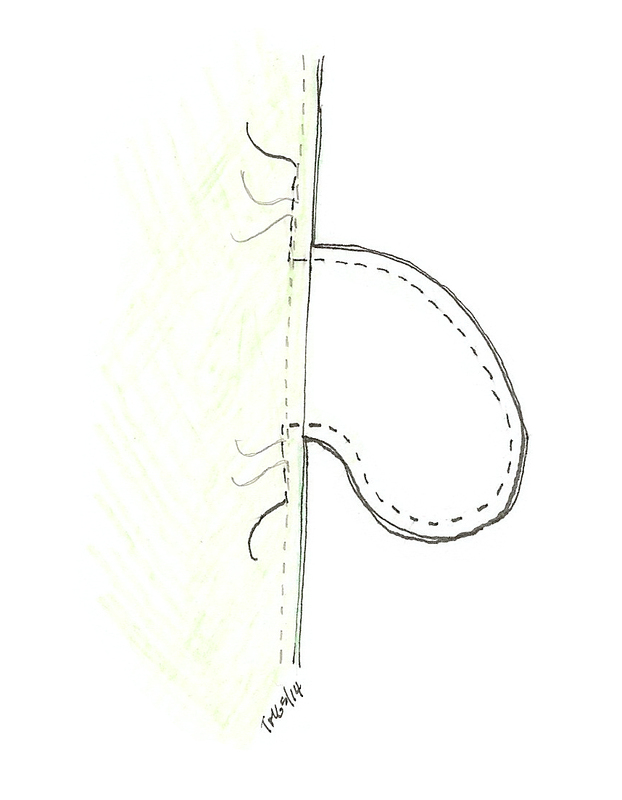 This illustration shows attaching the pocket to a seam you’ve ripped, which is still in place above and below the pocket. It’s the same if you’re starting from scratch, except that the other piece of the garment won’t be attached yet. Repeat this procedure with the other pocket pieces, making sure that any two sides which will be one pocket are aligned at the same place on the garment seam. Using your iron, press the pockets open, away from the garment. Don’t skip this step! It will make all the difference in a clean finish. To finish, sew the garment seam, including around the pocket. When you get to the top of the pocket, sew just inside of the pocket stitching and fabric, to avoid catching anything in the seam that will show. 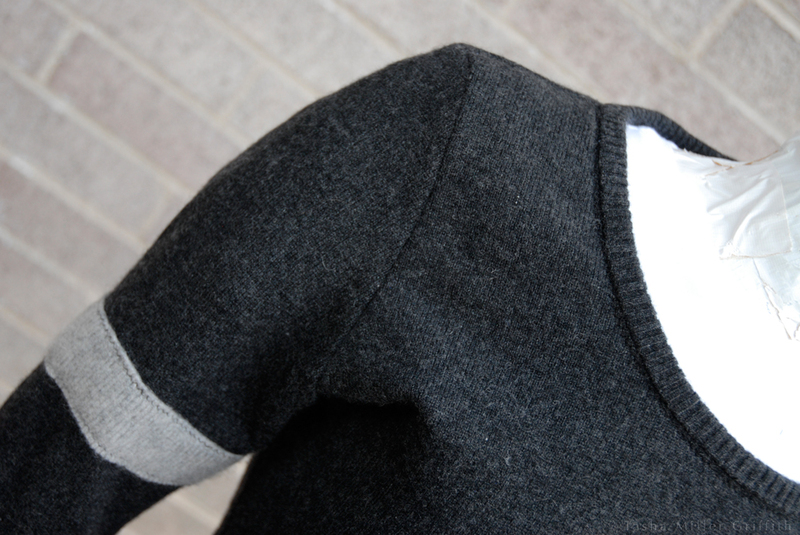 Stop with the needle down, and pivot at the point where the seam allowance matches on the garment and the pocket. Keep sewing, around the pocket, and pivot again when you reach a point just inside (towards the garment, not the pocket) the first seam at the bottom of the pocket. 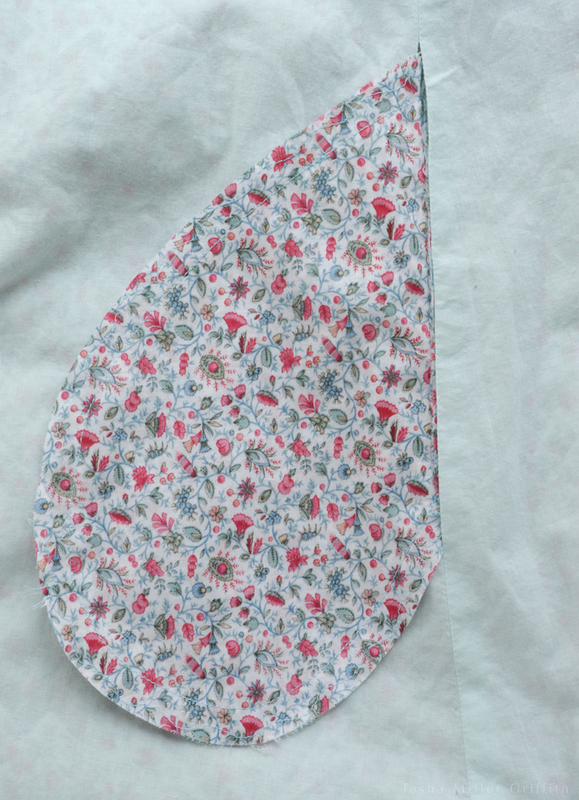 If you’re sewing from scratch, you’ll sew the whole seam above and below the pocket in this step as well. If you’re refashioning a pocket, you’ll start and stop just enough away from the pocket to overlap the old seam stitching. The stitching for this step is shown in the darkest color, overlapping the old seam, and just outside of the seam that attaches the pocket pieces. Look, brand new wonderful pockets! If your garment has a lining, you now have two choices. You can leave it alone, meaning the pocket will sit between the garment and the lining, which is usually good. 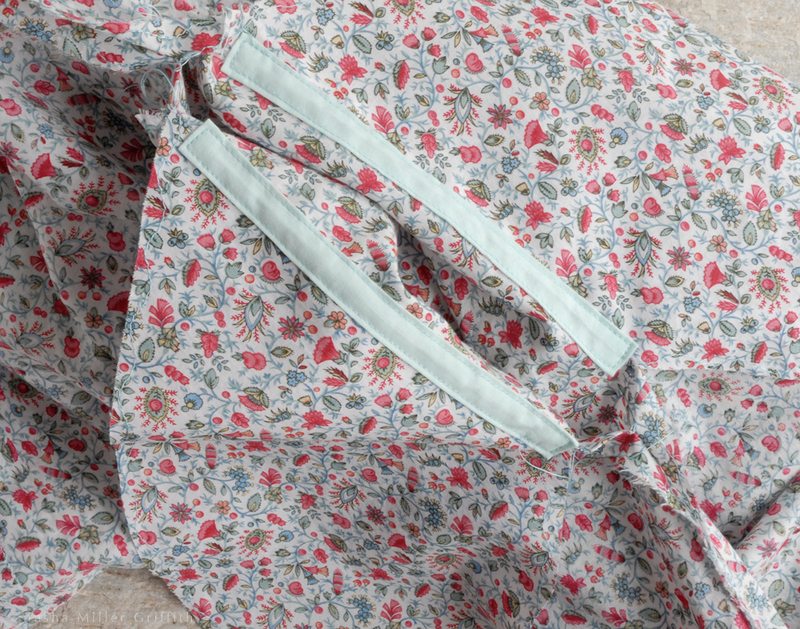 On my lightweight dresses, I decided to make an opening in the lining seam, so that the pocket would be inside the lining too, and show less from the outside. All you need to do for this option is to rip the lining seam at the pocket opening, or leave a gap when you are sewing the seam. Knot the thread ends, or back-tack your stitching, to hold the edges of the gap in place. 1. Cut strips 1/2″ wider and longer (for 1/4″ SA) than you want them to appear when finished. I made them 1/2″ wide finished, (cut 1″ wide) and slightly longer than the pocket opening. 2. Press the strips in half to mark the center, then press the SA under all around. 3. Topstitch each strip in place, close to the edge of the strips. 4. Sew the seam, and around the pocket, as you normally would. Have you ever added or improved pockets? What do you think about how the pockets in ready-to-wear relate to our society’s image of women? Any other relevant thoughts?